Meet Marissa: a brilliant, stylish, and incredibly well-travelled student. Marissa started travelling when she was ten years old because her family moved from Canada to Azerbaijan. When she was 13 they moved again to Basel, Switzerland where she attended the American High School across the border in Germany. When she graduated from high school, she decided to study Political Science and International Relations at McGill University in Montreal. 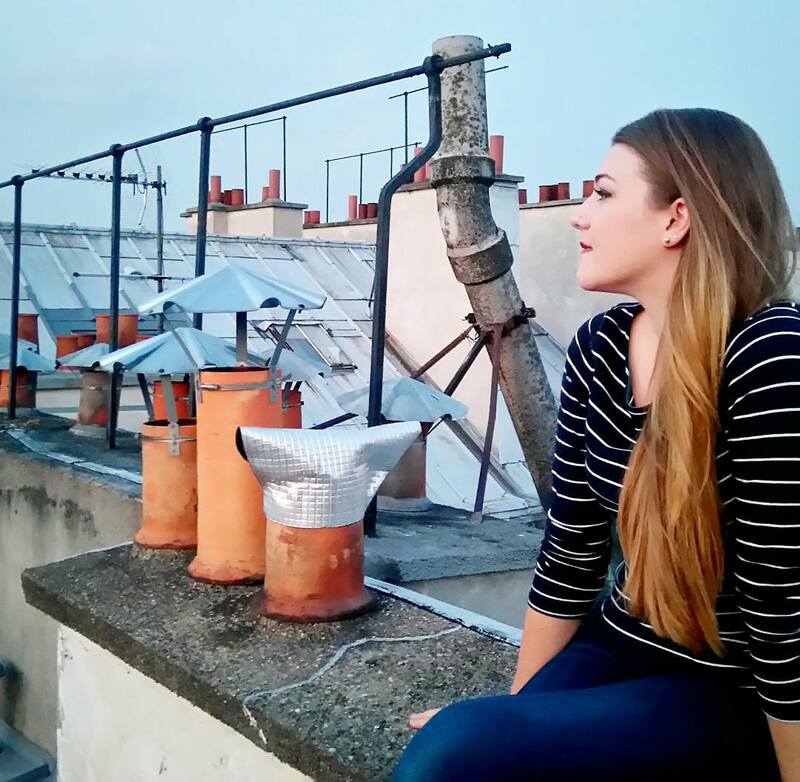 She’s chosen to wrap up her degree with a year abroad in Paris before graduating in 2018. Not a bad plan! A. “From” is a bit of a complicated question for me. Most of the time I give different answers based on who I am talking to. I was born in Ontario but moved overseas when I was pretty young. Right now I consider myself to be most comfortable in Basel, Switzerland where my parents live, or Montreal which is my Canadian base. The morning of a long trip I like to eat a huge breakfast and make sure I’m hydrated, and I always check in to my flight before I get to the airport just to cut down on time once I’m there. Q. What projects keep you busy? A. Right now I am just enjoying travelling and writing. I started a blog last summer, https://letrangerechezelle.wordpress.com/, where I post poetry, thoughts and photos from time to time to keep family and friends updated on my travels. I’m also a huge Instagrammer; I love finding beauty in everyday life and Instagram is a great way to capture and share that. My handle is midnight_chamomile. A. I travel as much as possible. Living in Europe makes it so easy to get away for the weekend and see something new. I’m pretty much a nomad in general since I don’t consider any one place to be my “home” and my friends and family are spread all over the world, so even when I am in my passport country (Canada), I feel like I am abroad somehow. This year in Paris I have been doing as many little trips as my schedule and finances allow, but I have also been making a point to stay in Paris sometimes to really try to get to know the city. I try to go to a new museum every Friday since I don’t have class and I love finding new shops or cafes around different areas of town. I have been doing a lot of travel between Basel and Paris to visit my family. I will usually go up on Thursday night or Friday and come back Sunday. It’s a short trip but it’s nice to get home even for a little bit. So far this year I have also been to Malaga, Geneva, Germany, and a bunch of different little excursions around Switzerland and France. This spring I have trips planned to go to Scotland in March and then to Azerbaijan in April. Since I am still a student most of my travels are based on where I want to go, or to where ever flights are cheapest. Usually with my family but often with friends as well. I hope to try to do some solo travels at some point in the near future because I think that would be a great way to become more independent and learn more about myself. For international flights, I always make sure to put my toiletries at the top of my suitcase so that they can be taken out if needed; same goes for my laptop. Q. How do you plan a trip? A. It depends on what my goals for the trip are. If I’m going to a place I have never been I tend to like to plan it all out to make sure I don’t miss anything important, but if I am going back to a city I know fairly well, I just like to wander around and find new things; or meet up with friends and just enjoy the change of scenery. Q. How do you think travelling often impacts your life? A. Travelling is definitely a great way to broaden your view of the world, it allows you to learn so much and develop a sense of cultural awareness and empathy for other people and their ways of life. There is so much in the world to see and appreciate and I think travelling is the best way to understand just how big and beautiful the earth really is. In my experience travelling often also makes me restless. I can’t stay longer than six months in any one place without going stir crazy. Moving around gets under your skin and once travel becomes a part of your life it is almost impossible to go back. This isn’t necessarily a negative impact, but I think a lot of times it can lead to an under-appreciation of the beauty in everyday life. Q. How do you pack for a trip? A. I usually pack the night before, especially for short trips I tend to just throw what I think I will need in my suitcase. I run through the checklist in my head: toothbrush, adapter, phone charger, passport etc. And make sure to bring one or two books for the trip. There is so much in the world to see and appreciate and I think travelling is the best way to understand just how big and beautiful the earth really is. I definitely structure my suitcase by clothing type so I can find things easily. I’m not big on grouping outfits together because I change my mind too often and want to switch things up. I’m also a strong believer in rolling clothes instead of folding them, it’s just better that way. For international flights, I always make sure to put my toiletries at the top of my suitcase so that they can be taken out if needed; same goes for my laptop. I would give anything to be a light packer! My whole life I have suffered from the fact that I cannot seem to reduce what I bring with me. I like to be prepared for anything and I like to have options, so it has always been impossible for me to travel light but it’s something I am working on for sure. Q. Do you have a pre-flight ritual? What do the 12 hours leading up to a trip look like? A. Pre-flight I always try to get as much sleep as possible, I make sure I am packed and ready, I usually make a quick list of things that I need to grab in the morning so I don’t forget. The morning of a long trip I like to eat a huge breakfast and make sure I’m hydrated, and I always check in to my flight before I get to the airport just to cut down on time once I’m there. Q. What are your favourite items to bring on a trip? A. I always travel with a book and a water bottle. Music is a must; I usually make a playlist of thematic tunes for my trip the night before. I also always bring a big scarf or pashmina with me in case I get cold. Chapstick and hand creme is also really important because I find the air is so dry on airplanes. The last thing I do is that I love to get to the airport a little early so I can pick up a coffee and a new magazine. Q. Any other travel tips? A. I’m a vegetarian, so I always have to make sure I order vegetarian meals before I travel, but I have found on many airlines that the vegetarian food is actually better than the regular food and they usually bring it a bit earlier than the other meals. So if you’re down to go veggie while you travel it could pay off!